Imagine yourself a high school student, say, 9th through 12th grade, taking math courses entailing astronautics or aerospace projects. Most projects usually run about six weeks. You are part of a team of three or four other students and collaboration is imperative. Even though you may have an inherent fear or dislike of higher math, the detailed lesson plans you’ll be working with are clear, concise, and cool. The projects also entail the best of the best astronautics and aerospace industries, like Boeing, R.E.L. (Skylon), Bigelow, and Virgin Galactic. There is one more thing about these projects geared mainly to Pre-Algebra, Algebra 1 and 2, and Pre-Calculus: each denotes an exclusive S.T.E.M. problem created for your high school. Welcome to the world of astronautics and aerospace, where they don’t call it rocket science for nothing! What you’ll be experiencing is indeed the real McCoy in the guise of a tangible academic exercise. The above description applies to our S.T.E.M. for the Classroom program. While some advocates for S.T.E.M. projects think or assume students should eventually choose similarly related fields as future employment, we feel differently. In our view, students taking S.T.E.M. courses can choose any line of employment or academic field and still profit from the experience. The cognitive discipline and academics is that exceptional and far reaching! How did these imaginative projects come about? While most S.T.E.M. projects average just a few days, ours were designed for half-semesters or quarters. The intrinsic concept correlates to developing and implementing a robust, comprehensive, and sustainable New Space commercialization program. Moreover, the conviction that best describes our ideology utilizes reuse and commonality to achieve affordable and profitable spaceflight operations. Our approach to sustainable rocketry in all aspects was itself influenced by a movie, October Sky, released in 1999 (and based on the book, “Rocket Boys,” by Homer Hickam). The narrative was centered on a trio of high school students in a backwoods West Virginia coal-mining community, who became interested in launching rockets. One of the students, Homer, grew up to eventually become a NASA engineer, while the other two chose to work in non-S.T.E.M. fields. We were smitten with this film for many reasons. Primarily, we realized its greater potential for seeding minds with elemental constructs for all that follows in life and chosen vocations. As for the apt title of this article, given the recent successful prototype of our Algebra 2 class during the 2012-2013 school year, those students did indeed boldly go where they never thought they could or would. The courses to follow, now well beyond the prototype phase, include the aforementioned Pre-Calculus project about to be launched in the fall which will extend through 2014. Here’s an example of one of our new Algebra 2 projects (http://www.stemfortheclassroom.com/2013/07/the-bell-curve.html) featuring the portion of the text under “Analysis” could suffice as an insight of what the project entails. Which brings us to our thesis of teaching: To offer high school students at all Socioeconomic Status (S.E.S) levels engaging S.T.E.M. projects at no cost. All that’s needed is an Internet connection, which most schools already provide. Our hands-on projects challenge students to step out of their comfort zone by designing real-world space missions using real-world spacecraft data, thereby gaining a better understanding of all four S.T.E.M. facets. As it turns out, designing and planning a space mission for the projects entails the use of the various mathematical concepts and equations students typically learn in high school classes. We also boldly set out on this path and wanted to find a way to give back to the community something totally innovative and highly stimulating. Ergo, a pragmatic approach to education that made better sense and would maintain a student’s interest. Now that we know the classes thus far taught were so well received by our students, we believe even more in the synergy of our S.T.E.M. concept. Additionally, there can be a 100% success rate for all those students to follow. This claim cannot be fostered by typical testing methods mandated for most school programs! What is our pragmatic approach given our version of S.T.E.M. projects? While the abstractions of mathematics involved in astronautics and aerospace can be daunting, only the basics of rocketry equations and mathematics are applied (i.e., algebra, geometry, linear equations, quadratics, square roots, natural logarithms, trigonometry, and pre-calculus). Students will also be required to develop a space mission app using a spreadsheet, develop a slide show using presentation software, embed said documents in a website that they build, and then demonstrate everything in a presentation done in front of their class. While we have no answer for the last statement, a legitimate explanation does exist for the other two questions we struck upon while conducting our research. It still shows that the more S.T.E.M. projects that students can be exposed to, the better their earning potential, regardless the education level or occupation. Having said all of that, we have to acknowledge that there may be legitimate arguments that many schools place too much emphasis on S.T.E.M. projects and not enough on the Humanities or Social Studies or other non-S.T.E.M. academic disciplines. We also agree that those subjects are an integral part of a well-rounded education. The adage, “One cannot learn or do mathematics if one cannot read first” is certainly true. However, in our defense as an astronautics-based organization, it is natural for us to focus on S.T.E.M. projects. We also revere the value of practical education on all levels. This is why we press on with myriad and distinctive learning convictions along such lines, and not just reliance on continued testing that we feel is too rampant in our schools today. For those who say that our society focuses too much on education as a way to get a high paying job instead of a viable reward unto itself, we wholeheartedly concur. The focus on money in our society has also led to questionable behavior on the part of the few that affect the many. Likewise, we believe in the Star Trek scenario, where you do a job because you like the job and because you can grow as a human being, not because of how much it pays. This is why we try to make our S.T.E.M. projects stimulating even if we do have a warped sense of what’s fun (all Star Trek puns intended). Besides, most of the students who completed the prototype courses said they had fun working out the parameters of each project. Imagine that: students actually enjoying doing math! Live long and work the problems, indeed! 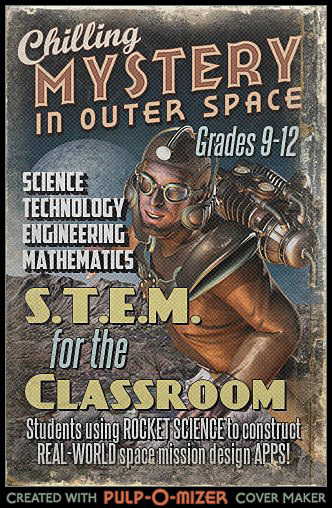 One final note worth repeating: we are not trying to encourage every student to go into S.T.E.M. related fields. On the contrary, we feel that exposing students to empirically-based projects provides for a well-rounded education, regardless what direction they go after High School. We want to help the teacher to encourage students to look beyond the textbook and to achieve something real-world that often lies outside a student’s comfort zone. This way students will always bring their particular talent to the projects, whether it involves art, writing, history, or any other academic subject. Conclusion: S.T.E.M. for the Classroom’s site list featured on our website (www.stemfortheclassroom.com) is only the start of our current offerings geared to a High School level of education. Namely, Pre-Calculus-Astronautics projects (conceived for Boeing, in four six-week units), and Pre-Algebra, Algebra 1 and 2-Aerospace projects. These single unit projects (about six-weeks) feature parabolic spaceflight (conceived for Virgin Galactic), orbital spaceflight (conceived for R.E.L. ), a space station design (conceived for Bigelow), and spacecraft landing (conceived for Spaceport America, near Las Cruces, New Mexico). These URLs reveal the entire presentation for students, but also provide a specific lesson plan for teachers. In short, we worked out everything for any math teacher who is willing to put forth a little effort to take his or her students higher, literally. Other future S.T.E.M. projects are also listed, including plans to introduce Elementary and Secondary levels of a similar nature, meaning all these envisioned projects are intended for above and beyond the earth’s atmosphere. Next post Can SpaceShipTwo fly up to space?